Yamato was a Anbu of the Village Hidden by Leaves. He was assigned as a temporary captain for Team 7 due to his ability of Wood Release. It allows him to control Kurama (Nine-Tails) which is sealed within Naruto. 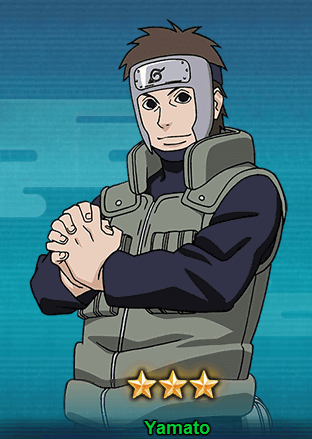 Yamato obtained the Wood Release ability from the First Hokage through the experiments conducted by Orochimaru. He was taken in by Danzo Shimura to the Root as Yamato as a kid lose his memory due to the experiment. During the Fourth Shinobi World War, Yamato was captured and used to strengthen White Zetsu Army. Let’s take a look at Yamato abilities. Ninjutsu Wood Style – Deep Forest Emergence: Launches a Barrier, increases by 40% the Attack and Ninjutsu attribute units in your Lineup. Before the first action in each round, when attacking your opponent’s team. It will launch Wood Style – Beam and affect maximum 3 units. Taijutsu Taijutsu Attack: Attacks the opponent’s front row and has a chance of a 3 COMBO and Low Float. Ninjutsu Wood Style – Beam: Chases and Attacks a High Floated unit, causes Repulse. Taijutsu Wood Style Chakra: Recover a certain percentage of Life when recovering Chakra each round.